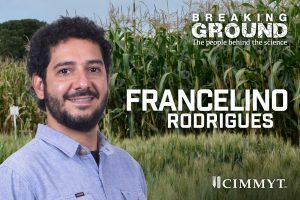 When Francelino Rodrigues started at the International Maize and Wheat Improvement Center (CIMMYT) in 2013, the majority of the maize and wheat trials were still being carried out by walking through the field and taking measurements manually. Through a collaborative work initiative with colleagues from maize and wheat breeding programs, and with support from senior scientists, Rodrigues brought a whole new world of digital mapping and proximal high-resolution soil sensing to the center’s trials thanks to his background in precision agriculture. Precision agriculture makes use of technologies and farmers’ knowledge to determine the quantity, location and time resources need to be applied to grow crops. The information gained allows farmers to farm more sustainably; using less while maintaining and improving yields. After completing his doctorate with an internship at the Commonwealth Scientific and Industrial Research Organization (CSIRO), an Australian government agency for scientific research, Rodrigues realized the importance of agricultural research for development and took on his post-doctoral position at CIMMYT within the biometrics team in remote sensing and precision agriculture. “Remote sensing can provide information at different scales and for a range of applications, from crop management to high-throughput phenotyping and landscape assessment,” said Rodrigues, whose research focuses on the analysis and interpretation of spatial and temporal agricultural data sets built up by the use of proximal and remote sensing technologies, then seeing how it can be applied across CIMMYT’s work. Remote sensing devices make it possible to observe the dynamics from single plants up to entire landscapes and continents as they change over time by capturing radiation from across the electromagnetic spectrum. “Precision agriculture and remote sensing technologies are used by CIMMYT to develop tools and practices to help farmers manage their crops more efficiently, to speed up the breeding process by rapidly assessing plant traits and to better characterize agricultural landscapes as a whole,” he said. According to Rodrigues, one of the greatest challenges is making precision agriculture accessible to smallholder farmers who don’t have the means to access new and expensive technology. He is currently working on a public-private project using remote sensing data assimilation and crop modeling to build an online platform that farmers can use freely in their fields to make crop management decisions. Rodrigues is excited about the long-term impact of CIMMYT’s research and positive about the future. “I love to work with a team of scientists from different disciplines and see that knowledge and results we generate contribute to a wider agenda,” he said.